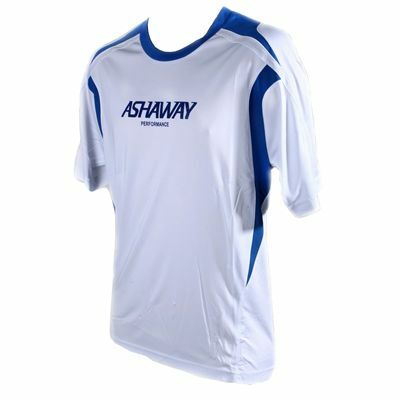 The Ashaway ARV300 mens T-shirt belongs to Ashaway’s Nero collection. It is made from Tec-dry fabric that is lightweight and breathable. The material draws perspiration away from your body and cuts over 85% of UV and Infra red radiation keeping you cool and dry. The Tec- dry material ensures superior comfort as it stretches and moves with your body. The T-shirt also provides mesh underarm and shoulder ventilation panels. XXS: 8 - 10 yrs. Waist 22" - 24"
XS: 10 -12 yrs. Waist 26" - 28"
S: Chest 34" - 36" Waist 30"
M: Chest 38" - 40" Waist 32"
L: Chest 40" - 42" Waist 34"
XL: Chest 42" - 44" Waist 36"
XXL: Chest 44" - 46" Waist 38"
for submitting product review about Ashaway ARV300 Mens T-shirt.